On August 3 the EPA released the final version of its Clean Power Plan, the Obama Administration’s effort to lower carbon pollution from existing power plants. It’s a big, complex rule—in large measure because it gives states so many options for compliance—but a few things are immediately clear. One, it’s just as well I never got around to reading the fine print of the proposed plan, because the final rule is practically a do-over. Two, this do-over goes so easy on Virginia that the Republican hissy fit about the proposed rule was (and is) a total waste of time. And three, Dominion Virginia Power’s little “rate freeze” gamble, rushed through the General Assembly this year, is set to pay off big for the company. The proposed rule was never as tough for Virginia to meet as opponents asserted. Their claims of billions of dollars in added costs had little basis in fact—indeed, a recent University of Virginia analysis found numerous errors in the Virginia Tech cost study that many detractors relied on. But the proposed rule had enough of a bite that it would have been a major driver of new policies and investments. By contrast, the final rule is so soft on Virginia that it will likely take a back seat to customer demand and market forces in shaping our energy future. This is welcome news to some, like Governor Terry McAuliffe, who pushed EPA to go easier on Virginia and is trumpeting the results as a good outcome. 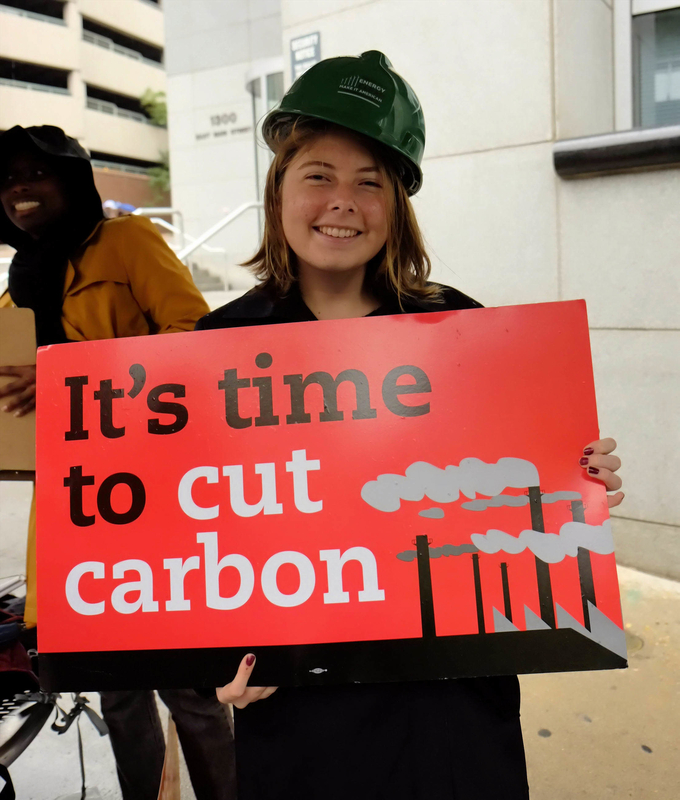 It’s a disappointment, though, to those who are worried about climate change and who believe Virginia is well positioned to make much steeper cuts in carbon pollution than the new rule requires. Look at EPA’s table below and you will see how easy our path is. The Clean Power Plan allows states to choose whether to measure carbon emissions by rate or by mass. Using rate, EPA’s analysis of the business-as-usual case projects Virginia would arrive at an emissions rate of 959 pounds of carbon dioxide (CO2) per megawatt-hour by 2020 without the Clean Power Plan. With the Plan in place, that number will have to drop to 934. That’s a difference of only 3%, an easy target to meet just by adding enough emissions-free wind and solar to the existing fuel mix. Alternatively, the state can choose to measure CO2 emissions by mass (total short tons of CO2 emitted). Using that approach, EPA says all Virginia has to do is ensure CO2 emissions are no higher in 2030 than they were in 2012. Indeed, the 2030 goal is higher than what EPA expects Virginia to accomplish under business as usual without the plan! In other words, we can achieve our assigned goals just by using energy a bit more efficiently and meeting any increase in electric demand with renewable energy. Lucky for us, this happens to be exactly what customers are asking for—especially the companies that are driving the growth in demand, including data centers and hi-tech companies. Companies like Apple, Google and Amazon are committed to running on wind and solar. And given that leaders from both parties in Virginia support energy efficiency and want to see our utilities add wind and solar to their portfolios, compliance with the Clean Power Plan is a no-brainer. Heck, if the utilities aren’t interested in deploying renewables, the private sector will be glad to do it. The legislature could just loosen up the utilities’ monopoly protections, open up the solar and wind sectors to fair competition, and let private renewable companies and big utilities have at it in an open market. But wait, there’s more: remember all the bellyaching from legislators about how West Virginia and Kentucky had it so much easier than we did under the proposed rule? No longer. * Not only does the final rule make it harder for them than for us, but it also proposes a system for buying and selling clean energy credits known as Emission Rate Credits, opening the possibility of a tidy little profit opportunity. If Virginia ramps up renewable energy production beyond what we need for compliance, as we can easily do, there might be some eager buyers just over the border. Of course, anyone truly concerned about climate change has to hope our neighbors will proudly surpass their carbon reduction goals and even set tougher ones for themselves. Even if they don’t, we hope Virginia will set aggressive climate goals for itself, foregoing the opportunity to profit from selling credits. But it’s nice to know that if we don’t achieve these heights of virtue, there is money to be made. For the moment, Virginia Republicans are still bashing the EPA as though the Clean Power Plan were anything but an opportunity. One has to wonder whether they’ve even read the new, final plan. In an op-ed published August 8, Delegates Israel O’Quinn and Scott Taylor claim the Clean Power Plan will have “severe” effects on Virginia’s economy, citing the highly questionable claims of conservative State Corporation Commission staff, made months ago about the proposed plan. No doubt the delegates wrote their piece before the final rule came out, and didn’t want to consign it to the dustbin just because the rule turned out to be a creampuff. That must also be why Virginia Republican leaders joined the Koch-funded Americans for Prosperity at a rally at the University of Richmond on Monday evening to lambaste the EPA. There, they launched a bill that would require General Assembly approval of any state implementation plan (an approval which, they assure us, will not be forthcoming). Republicans don’t intend to give up their talking points just because it turns out their hysteria was misplaced. Anti-regulatory zealotry is impervious to reality. They’re not the only ones who don’t want to admit the final rule will be cheap to meet, and could even save customers money. Dominion lobbyists spent the whole of the 2015 legislative session ginning up fears that the Clean Power Plan would cause skyrocketing electricity bills unless legislators passed a law (SB 1349) freezing rates and limiting regulatory review. The lobbyists’ pitch was that the legislation would keep Dominion from passing along compliance costs to ratepayers. The immediate effect, however, was to protect the utility’s excess earnings, avoiding rebates and rate reductions for customers. The upshot is that for the second year in a row, and for several years to come, the General Assembly will allow Dominion to overcharge consumers. Recall that in 2014, the utility won the ability to charge ratepayers for 70% of the hundreds of millions of dollars it had spent so far on a new nuclear plant that may never get approval (especially now that we’ve seen the price tag). The maneuver soaked up enough of the company’s excess earnings to avoid a refund. As a result, concludes the analyst, Dominion will rack up excess earnings. “Looking forward, projected revenues for the 2016 rate year will exceed the Company’s cost, including a fair rate of return, by approximately $229.4 million.” But, he adds, “because of Virginia law, the Company’s base rates cannot be adjusted downwards prospectively in the current case.” That’s just 2016. SB 1349 shields Dominion’s earnings from review through the end of the decade and prevents rate adjustments until 2022. *There is a delicious irony here. Under pressure to produce a rule that will withstand legal attacks from coal states, EPA changed the approach to be more even-handed and thus more defensible—but with the result that it is now much harder for coal states to comply. **Dominion’s maneuvers may be bad for customers, but they have been very good for shareholders. Dominion Resources just reported second-quarter earnings of $413 million, more than twice as much as the same period last year. SB 1349’s patron, Senator Frank Wagner, did pretty well, too. Since January of this year, Wagner has collected $6,000 in campaign contributions from Dominion and another $23,000 in contributions from several of its top executives—including CEO Tom Farrell, who can easily afford it out of his $17.3 million compensation.